Glyn Howatson, representing Wales, David Macarthur and Richard Henderson, Scotland and Philip Dawson England, comprise the line-up of judges announced for the 2015 Borderway Agri-Expo taking place at Borderway, Carlisle, on Friday 30th October 2015. With a prize fund of £15,000 and entries increasing year-on-year, this is now the leading winter livestock event in the UK. Over 800 head of the finest animals in the country are expected to be entered which includes sections for pedigree breed society calf shows. Judging them all is always a major challenge and one which is only possible with the highest levels of specialist knowledge and experience. Harrison and Hetherington have announced that eminent Limousin Cattle Breeder Glyn Howatson of TyNewydd, Nantglyn, Denbigh, will judge the main cattle classes. Baby Beef judge will be farmer and breeder David Macarthur of Mid Fleenas, Nairn. Taking up the roles in the sheep section are Richard Henderson, livestock procurement buyer for Woodheads Bros, Turriff who will judge the main sheep classes, while the mule Gimmer lamb class will be judged by Philip Dawson of Kentmere, Kendal. Glyn Howatson, who is judging the main cattle classes, farms 1200 acres in partnership with his father, running a Suckler herd of 140 head of mainly Limousin and British Blue Cross home-bred cattle and a thousand North Country Hill Cheviot breeding ewes. They regularly show their home-bred cattle and won the Welsh Winter Fair in 2006. David Macarthur, who has judged across Scotland, farms 250 acres and a herd of 90 suckler cows in partnership with his father. He also farms 300 acres separately, with a flock of 600 commercial breeding ewes, and arable crops. In judging the baby beef classes he will be practising what he preaches, and looking for something similar to the traits to his own stock, something with good shape, correctness and a bit of character and show appeal. 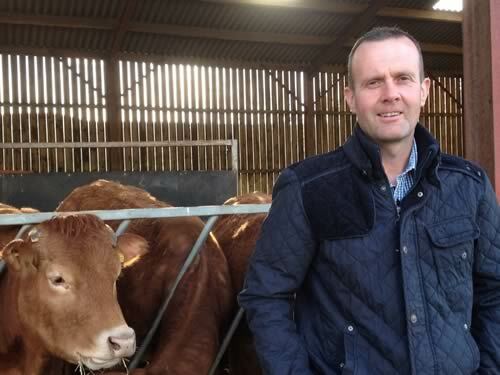 Working out of the Turriff office, Richard Henderson is livestock procurement buyer for Woodhead Bros. In his spare time he looks after his small flock pedigree Suffolk sheep (Binhill Farm). Richard has judged prime sheep at many shows across the North of England, and Scotland, and last year judged the carcass classes at the Scottish Winter Fair. “Supermarkets need a range of lamb on the shelves as their customers want a choice. Some prefer their lamb lean, some prefer it with that bit of fat. Some like a small joint and some a larger joint. As an industry we need to supply them with this choice. We must not breed our animals too uniform." Cumbrian Judge Philip Dawson farms 1000 ewes at Kentmere in the Lake District. He regularly sells Bluefaced Leicester Tups and Lambs at Borderway. He also sells North of England Mule gimmer lambs at Lazonby from his flock of 600 breeding ewes. In judging the Mule Gimmer ewe lamb class he will be looking for good clean colours, good skins and butchery potential. Entries are now being taken for all classes.